Sense and antisense C9ORF72 transcripts rarely exist in the same aggregate, but what about the five polydipeptides? The Edbauer group observed them mixed together in hippocampal cells taken from a person carrying the hexanucleotide expansion (see image below). To cap off all this RNA research, the haploinsufficiency hypothesis also gained some currency this month. In the October 29 Acta Neuropathologica online, senior author Petrucelli and first authors Veronique Belzil and Peter Bauer, also at the Mayo Clinic, report that in the brains and blood of expansion carriers, the expanded C9ORF72 gene totes methylated histones. 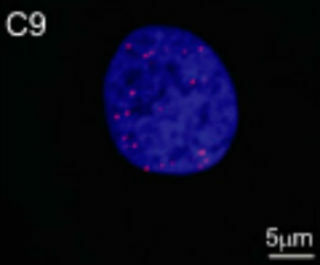 Such modifications are known to silence genes. Their results confirm a study that reported C9ORF72 methylation earlier this year (see Jun 2013 news story). The finding suggests that a partial loss of C9ORF72 function might also contribute to disease. Scientist have reported that in people with C9ORF72 repeat-based disease, expression of the C9ORF72 mRNA in blood and brain is abnormally low (see DeJesus-Hernandez et al., 2011, Gijselinck et al., 2012, and Renton et al., 2011).